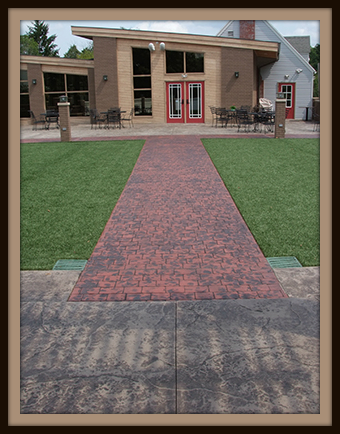 If you have ever been completely awestruck when gazing down at a patio walk or driveway… if you feel like you are on the famous Yellow Brick Road on your way to the Emerald City instead of your neighbor’s pool deck, then you are one of the many who have discovered the allure and versatility of stamped concrete. 50% less than the cost of natural slate or limestone. WOW! Low maintenance. The stones won’t settle over time, and there are no joints or grout that can open up to let grass or weeds sprout. Longer lasting than paved stone and still resembles the look. Unique colors and concepts to create the look you’ve always wanted…and Platte Brothers can help you plan your projects. Platte Brothers Concrete boasts ____ years combined experience and can transform your home into your dream home. Okay, although it is fun to talk about the wonderful look of Platte Brothers stamped concrete and its many creative uses and colors, on occasion it is necessary to have something done that doesn’t require something…well, so beautiful and special. Sometimes just regular old concrete will do the trick. Platte Brothers Concrete also specializes in flatwork for driveways, foundations, agricultural, basements, approaches and garages.